The National Honor Society in Neuroscience, Nu Rho Psi, has awarded a chapter to Syracuse University. Known as New York Delta, the chapter is the fourth of its kind in the state. Nu Rho Psi is an independent, nonprofit, grass-roots organization consisting of more than 80 chapters and 5,100 members. The invitation-only society encourages professional interest and excellence in neuroscience scholarship. 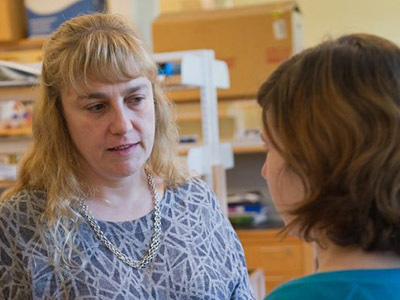 Faculty advisor Katharine “Kate” Lewis says New York Delta is a testament to the “strength, breadth and depth” of neuroscience-related curricula and research at the University. Biology Professor Katharine “Kate” Lewis is the chapter’s faculty adviser. New York Delta currently is accepting applications for membership. The chapter is open to graduate students in the Interdisciplinary Graduate Neuroscience Concentration (I-GNC) and to undergraduates in the Neuroscience ILM. Faculty members and alumni of either program also may apply. For more information, contact Lewis at kelewi02@syr.edu. A downloadable application form is available at neuroscience.syr.edu/curricula/honorsociety.html. Upcoming New York Delta events include NightLab: Brainfreeze on Friday, Feb. 1, from 6 to 8 p.m. at the Milton J. Rubenstein Museum of Science & Technology (MOST) and the chapter’s inaugural induction ceremony, scheduled for later this semester. Lewis considers Nu Rho Psi a “springboard for collaboration and networking” among people interested in the brain and nervous system. Chapter officers are all A&S undergraduates: President Gabriela Susana ’19, Vice President Julia Riley ’20, Secretary Taylor Sorice ’20 and Membership Director Elaine Marji ’20. The Faculty for Undergraduate Research founded Nu Rho Psi in 2006 to develop national and regional networks for the enhancement of undergraduate neuroscience education, research and faculty development.